This week sees the 25th anniversary of the birth of Louise Brown, the world's first test tube baby. In the first of a series of articles marking the anniversary, BBC News Online speaks to the woman who was the second to carry an IVF child. 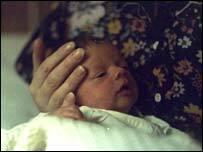 By chance, and chance alone, from dozens of women in the first trials of IVF, the first child was born to Bristol woman Lesley Brown on 25 July 1978. Louise was literally carried from the operating theatre into the spotlight of a television camera, and the camera has intruded into her life - and those of her family - at regular intervals since. A few months later, and to far less fanfare, Britain's second IVF child, and first boy, was born. Alastair MacDonald, like Louise, is also approaching his 25th birthday, but his mother, Grace, is grateful for his normal childhood. "I always felt that Lesley was deprived of that special private moment that all mothers should have," she said. "There has been so much press interest in Louise." In fact, once the initial attention had died down, the family, from Denny, near Stirling, were pretty much left alone. 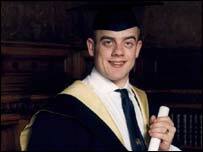 Grace said: "Alastair didn't even know that he was a test tube baby until he was nine. "He was watching television and he saw a report about the death of Dr Patrick Steptoe [who along with Dr Robert Edwards pioneered the IVF technique]. "He saw him so often, he thought him a second grandfather. "He came running in crying, and he realised straight away what had happened." Being second did not make the path any easier for Grace, now 56. She was one of dozens of women recruited for Steptoe and Edwards' trials at Oldham General Hospital. Grace had been told she was infertile in 1972, but had refused to accept a childless life. "I just kept thinking, they must come up with something to help," she said. A bizarre coincidence led her to Dr Steptoe. "I was at a friend's house, and they had a copy of the Lancet medical journal lying around open on a page with a report about the research project. "I'd never read it before, and never will again." This in turn led her to Steptoe's office. "He was quite brusque with me really - I think he was just to make sure that I had enough staying power to stick with it." Optimism is something that Grace has in bucketloads, and she feels it was vital in the fact that, after dozens of failed attempts, she managed to get pregnant. The atmosphere surrounding the Oldham trial was one of intense secrecy. "I didn't tell anyone what was happening - not my friends, and not even my family. "I kept making these trips south - some of them were convinced I was dying from something." In the end, on the second cycle of treatment, she produced just one egg. "I couldn't believe it - it was such a wonderful feeling after waiting so long." Her luck held, and that one egg became Alastair in January 1979. She has remained good friends with Lesley Brown, and followed the progress of Louise with interest. Alastair's path into adulthood has, like Louise's, been a picture of normality. Like many men of his age, he is still living at home with ihs mum. A recent attempt to join the RAF was unsuccessful, but he remains in pursuit of other career paths, and job interviews are approaching fast. Grace, naturally, has little time for those who believe that IVF is unethical and should be stopped. "How can they say that? I see all these beautiful children. "It's just nature being given a helping hand." Have the scientists gone too far?